You’re going about your day to day—building relationships, making deals, slapping high-fives; the fun parts of running a property management business—and some slick salesperson claiming to be affiliated with Google starts telling you about some “magic bullet” called SEO. What is search engine optimization (SEO) and why should property management companies care? In a nutshell, SEO is when you help search engines like Google know what your website is all about. After all, search engines are really just cyborgs hungry for data. SEO is a way to help those search engine cyborgs better understand the information on your site, so that they can recommend it to users looking for that information. Is there a magic bullet that will put you in the #1 spot on Google search for the rest of time? So, even if you spent a lot of money hiring an SEO expert when you first built your site, chances are you could still do a little better. When it comes to SEO for property management businesses—it should be an ongoing process. Keyword Density — Your webpage needs to have words on it. But, there’s a delicate balance in how many of those words represent the search terms you want to show up in Google for. A well-optimized homepage usually has around 500 words on it, but longer content can also convert very well given you have the right keyword density. You usually want your “keyword” to make up between 2-3% of the content on the page. Don’t write for the cyborgs — As you’ll see below, it’s no longer relevant to write your website copy specifically for the cyborgs. Your copy should always be written to provide the most immediate value to a human being looking for something. Are you solving a problem? Showcasing benefits? Providing a competitive value? These are all things that help your property management website rank higher in the long-run. Use title tags, headers, and sub-headers — Again, make your content easy for the A.D.D. addled world. Sub-headers are a common, yet effective SEO trick. When you use H1, H2 and even H3 tags and you have the keyword in it, your webpage is counted to have better on-page optimization factors. If your SEO guru did their job, your content is already setup this way. A good way to think about SEO is to understand how newspapers and magazines break up their content. Open a magazine and notice how there are headings and sub-headings, and quoted text that’s pulled out and highlighted. There are photos with captions, and post-headings. This isn’t an accident. This makes it easier for people to consume content and find what they’re looking for. It’s also a great way to serve the SEO cyborgs exactly what they’re looking for. But, it’s not the only thing. Your SEO guy might have gotten you this far, but the Internet is a moving, growing, evolving organism. Remember the cyborgs? They like fresh content. They like sites that are constantly adding a new perspective on information. They like “living websites” that are always adding new content. Why do they like fresh content? 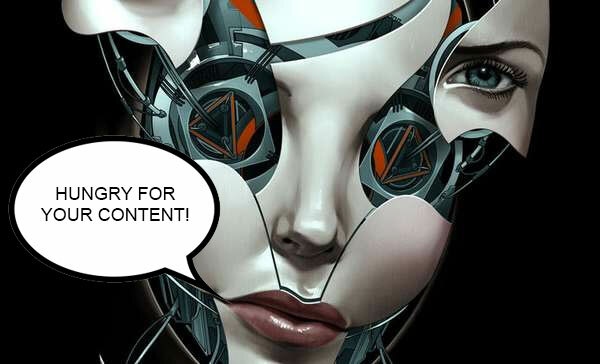 Because they’re HUNGRY CYBORGS on the hunt for fresh meat—er…content. When you post new content to your property management website and blog on a regular basis, search engines are able to see the people who share that link to various social networks, they see other websites that link into that new content. Each of these things that the cyborgs see is given a time stamp. This new information is then added to the historical information that the cyborgs have about your site and when it’s all put together, you get a relevancy score. Because information, answers, and how the public consumes content changes over time, the more recent the time stamps on your content, the more relevant some cyborgs might find it. If you’ve been putting out the same kind of content on your site for a long time, then you start to be recognized as a valuable source of information for a particular subject. This is sometimes called AuthorRank—and it means you’ve been identified as a thought leader in your industry. The reason having a regularly updated blog is so important, is because it entertains the cyborgs. They begin to see you as someone they can trust for certain content, and so they drive traffic in your direction. And just like in property management, trust is a form of currency in the SEO world. Good SEO is about creating compelling content and forming relationships online with people who will share that content. Is your property management website playing nice with the SEO cyborgs?